Yes, I've thrown many a showers and gatherings in my home but tomorrow is different. It's the last bridal shower for anyone on my side of the family. The last sibling is to be married and these are special times. Many things are in order for our new and improved "tidied house"--at least on this main level--that now only holds a 1/3 of the "stuff" it used to. And many things are to be completed today and tomorrow. More paper flowers to make. A special family recipe to make. The art room. Always the art room. The girls get to help weed, clean off fingerprints from the front and back doors (truly something I never think to do! ), help wrap our party favors, make a lime water ice ring, and get cobwebs. These are fun times for sure. Nothing is better than family and family celebrations are best! After some tossing and rearranging I have a colorful, easy-to-navigate medicine cabinet again. And best of all my kids know exactly where everything is to help themselves when they have an ailment. And all of my most important potions and oils, winter balms, and homemade sprays are all in one place now and I'm loving it. Definitely the most used items in my medicine cabinet are my therapeutic-grade essential oils. And seriously I mainly only use a handful most of the time: my lavender, peppermint and Thieves blend. And that's the simple tour of our medicine cabinet! I love that my kids know where things are in the cabinet and that these essential oils are safe enough for them to apply many of them on their own when needed. I hope this inspires you to toss out the things you don't use in your cabinet and maybe replace an over-the-counter drug with something natural and test it out. See if it works and brings joy to you and your family. Go out + be healthy! Hope you have an incredible start to a brand new week! Sitting among all of the hundreds of books gathered from every corner of my house, I recently began the sorting of books, one by one. My task: hold each book and ask myself if it sparks joy or not. If not, then it went in the donate pile. It took hours one morning and by the end my emotions were spent from the sentimental experience of the work but I did it. In the end, I sat and stared at the small pile of books we chose to keep: a handful of books for me and Bobby and the few piles of children's books. That was it. The books that truly make us happy right now. Roughly 300 books towered the "donate pile" (picture below). Some were very easy to get rid of that don't really touch our lives. Others, though, required some deep searching of my heart--Had this book already brought me joy and I no longer need it? And what about this children's hardback picture book that I've spent some of my most precious mothering hours reading to every single one of my children--even if we've moved on from it's story what happens to all of those sentimental memories if I get rid of it?? And what about all of those books I asked for and was given as gifts or that I bought with my own money when I was super into the subject--some I've read and others I haven't even cracked open?? I picked up a few cookbooks and took a decision-making break to flip through them. One particular baking book made me stop in my tracks. I could see cake batter stains on one heavily used recipe page. This book had taught me the very beginning lessons of baking. 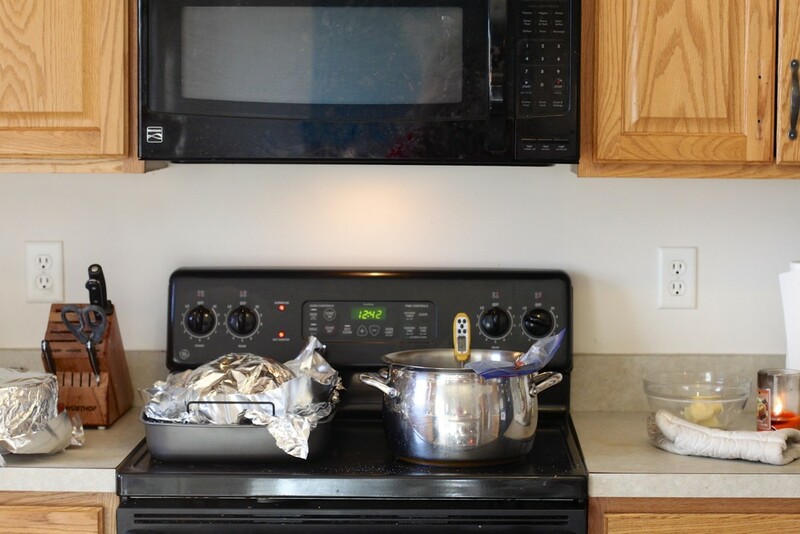 It gave me the confidence in the kitchen when I was smother to just my toddler Caroline. I baked a thousand times from this book. So many emotions and memories came back from years of its use. I sat there and cried. How in the world could I let this book go?If I'm honest with myself, it does not spark joy-- anymore. I use it from time to time. Well, not too much lately. But there's the memory of what it's given me and what it's always represented in my life. Surprisingly, I shut the book, held it firmly in my hands, and thanked the book aloud for all of the memories of happy kids at breakfast from its' recipes, many lessons it taught me in the kitchen, and the sheer comfort of its pages for so many years of my mothering. I then walked over and put it in the donate pile, knowing very deeply that what had once brought tremendous joy had served its purpose then and now I could let go of it. It is the most incredible feeling to only keep the books in our life that spark joy now. We have donated two bookcases and our large living room bookcase now has many empty cubbies. (Cubbies that now will hold library books.) I can't even begin to tell you how freeing it is. As I tidy, I am increasingly surrounded only by what I need and love right now. If I had a book cluttering my house all those years and never read it then my lesson learned from that particular book was it wasn't important enough. The lesson I've continued to learn is that life without all the extra "stuff" means we love what we do choose to keep. Like our current favorite children's books--enjoying what we've kept and loving the space/freedom from the books we only half loved/read. What would happen if your home only held the books that spark joy in you and your family? 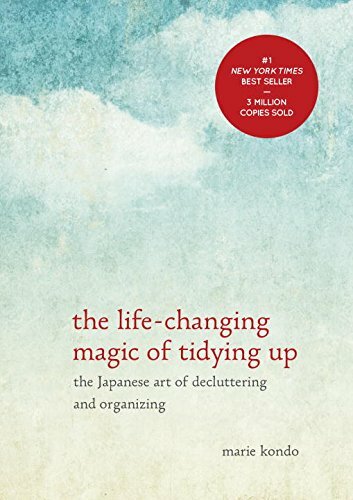 How would your daily tidying change? Your peace within yourself + in your home? 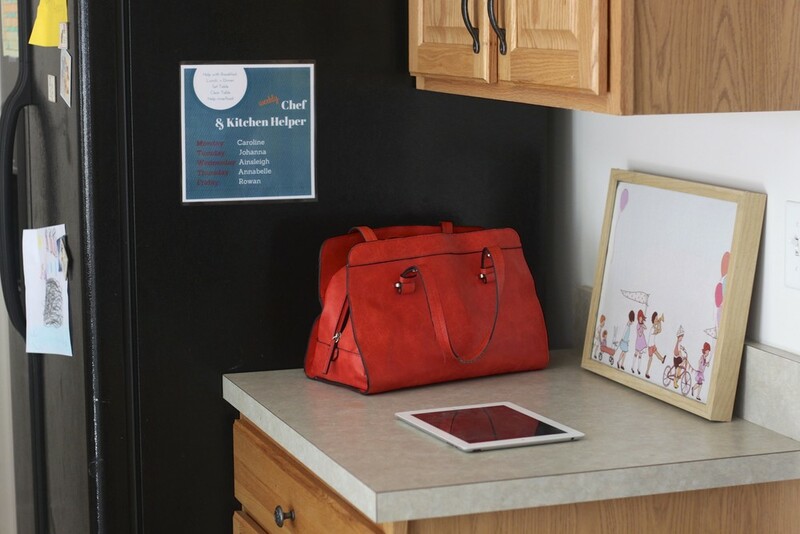 Take one step towards simplified living and try it out. And watch the impact create further changes in your life. My father is the one that taught me to never give up. I still have the calligraphed "Never Give Up!" cardstock he made for me during a difficult time in high school. I've kept it on my dresser for over 15 years. My father spent the weekend with us, tried out his funny voices on my kids as he read them stories, and sparked such excitement in our home over the past few days. And my Bobby was celebrated with simple things yesterday: construction paper cards, homemade cookies, pictures, and well-practiced songs sung. He provides so much stability, consistency, and peace in our family; he truly anchors our family. I'm grateful for the men in my life, even down to the youngest, bushy-haired, future-daddy that I'm currently raising. I want him to be strong yet gentle, confident and peaceful, and to someday be an anchor to his own little bushy-haired family. How I look forward to watching it all unfold. Life is a blessing. I am almost finished with the very first step of tidying a home based on Marie's technique--"Tidy once using my technique and you never have to tidy again" method. Clothing is the first step. And so clothing from every floor of the house has been dumped in heaps and gone through, piece by piece. We're talking my maternity clothes, baby clothes, seasonal kids clothes, etc. And as I hold up each item of clothing and ask myself if it "sparks joy" I continue to surprise myself by filling more and more donation bags and hanging up less and less in everyone's closets. And so there is less to keep, more to enjoy/love/appreciate of what we choose to keep. And ultimately, less to fumble over, put away, and "deal with". 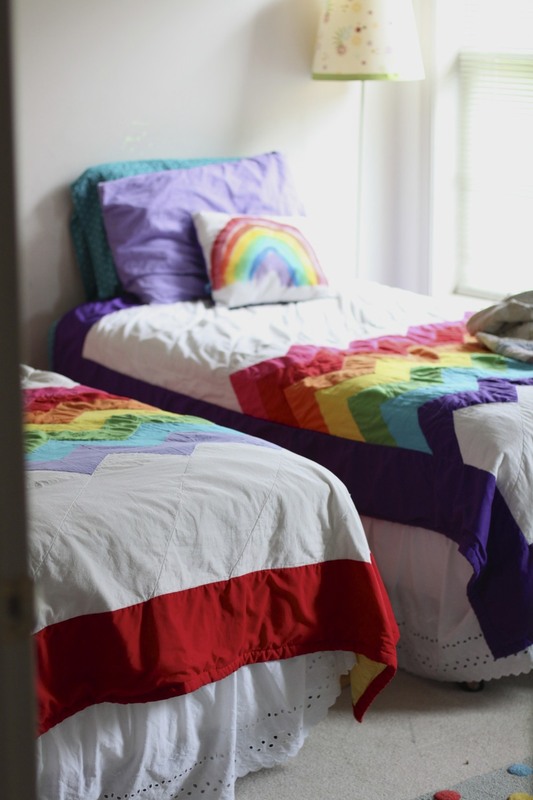 What I love most from this whole family transitory experience is my girls interest and desire to own their rooms, personal items, and clothing in a more meaningful way. Ainsleigh has been asking throughout the week to keep showing her how to properly fold her pants, shirts, underwear, etc. She wants to keep her drawers functional. And she feels the excitement that comes from order + essentialism. Despite the fact that company is coming this weekend, there's another ballet performance, and Father's Day on the radar, I'm feeling okay that piles of "stuff" have been lingering around many corners--some waiting to be bagged up and other piles still waiting to be decided up. The progress is slow but boy, is it liberating. Once clothing is "tidied" by the end of this week (my goal is by Saturday night) then books are next. 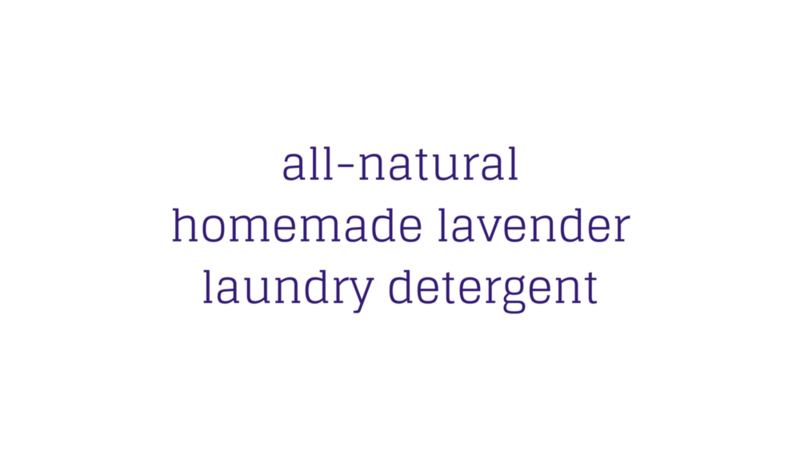 Here's a recipe you've asked about and I'm here to show you step by step: our all-natural lavender laundry detergent! Make, enjoy, + wash!